Plasma screens aren’t just used for home cinema. They also have a whole separate parallel existence in the world of big business, employed as large screen displays in company lobbies and in boardrooms where projectors and bulky CRT monitors aren’t practical. 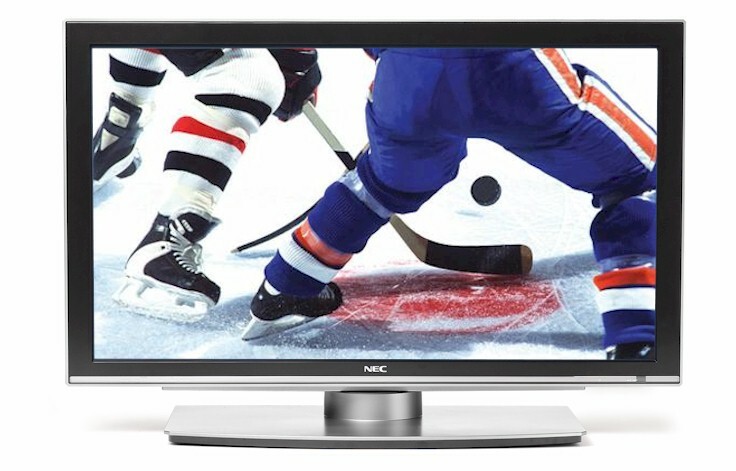 NEC manufactures plasma screens for both commercial and consumer use and the 42XR4 is a curious blend of the two. The first thing to point out is that, technically speaking, the 42XR4 isn’t a television. Unlike all the other sets on test, NEC’s display doesn’t actually feature a TV tuner –digital or otherwise – and requires the separate purchase of either a Freeview, cable or satellite box in order to view TV broadcasts. This in itself isn’t too much of a problem, as Freeview can be added fairly cheaply. However, since the 42XR4 has no Scart sockets and comes with no adapters for any of its other connections, physically hooking the screen up to external devices canprove to be something of a pain. Conversely, the 42XR4 has high-def connections in spades. There are two HDMI sockets and two sets of component inputs, as well as a VGA port. Usefully, each of these inputs has its own corresponding button on the remote control handset, which is a much better system than having to switch between devices via an on-screen menu as with some other sets. Apart from the input selection, the remote handset is strangely bereft of buttons, largely due to the 42XR4’s lack of tuner and Teletext functions. What buttons there are, however, have been positioned badly. It’ll take you quite a while toget used to the off-centre fourway cursor pad and enter/exit buttons. None of this would really matter if the 42XR4 outshone the competition in terms of performance. Unfortunately, this wasn’t the case in our tests. There isn’t anything especially bad about the picture quality, but no matter how much we experimented with the display settings we just weren’t particularly blown away by what we saw. Even over HDMI, hi-def footage and upscaled DVDs lacked lustre and we needed to turn down all sharpness and noise reduction settings to compensate for a certain amount of unusual artefacts. Sadly, detachable speakers and some advanced picture-in-picture options just don’t make up for it.